Of these artists, Hitch (1841-1935), deserves to be better known. Following an apprenticeship to Farmer and Brindley, he had a very long and distinguished career as a sculptor: his work can be found at Cardiff Castle, suggesting that he was probably a member of William Burges's workforce there, and also in many churches and cathedrals including Truro Cathedral and Westminster Abbey. He was particularly associated with the architects W. D. Caröe and J. L. Pearson. It is worth noting that the popular London Encyclopaedia disagrees about the dates and artists involved here, stating simply that the building was "erected in 1875, the ground floor being remodelled in 1905 by H. Fuller Clark. 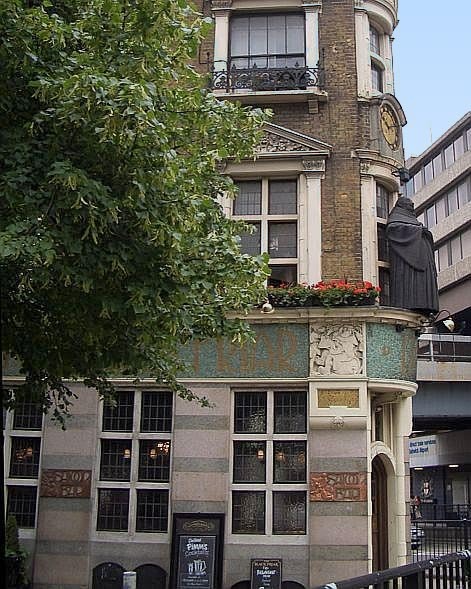 The outside is covered with mosaics and carved figures by Henry Poole (1903)." However, Ward-Jackson's considerably longer discussion is clearly more to be trusted. The figure of the Black Friar himself was certainly added later: Ward-Jackson thinks it was probably in 1983. 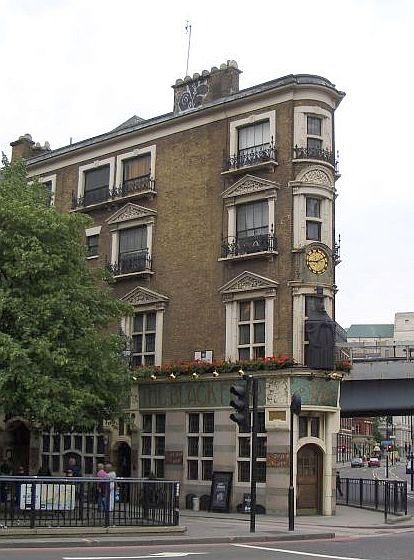 Both Poole and Clark were committed members of the Arts and Crafts movement, and really went to town (or, rather, city) over this fabulous little pub. Despite its distinctly medieval feel, the decor is also sometimes classified as Art Nouveau. 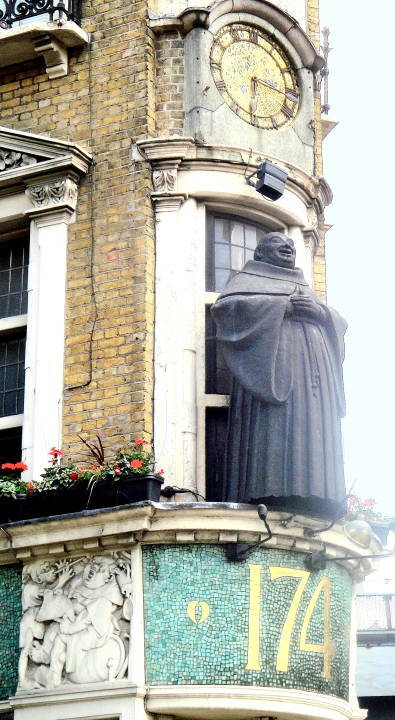 While not one of the new breed of gastropubs, The Black Friar can also be recommended for its food, especially its pies! Curl, James Stevens. “Fuller-Clark, Herbert (1869-after 1912).” A Dictionary of Architecture and Landscape. 2000. Web. 25 July 2011. History provided on The Blackfriars menu. Speel, Bob. Henry Poole, R.A. (1873-1928). Web. 25 July 2011. Weinreb, Ben, and Christopher Hibbert, eds. The London Encyclopaedia. 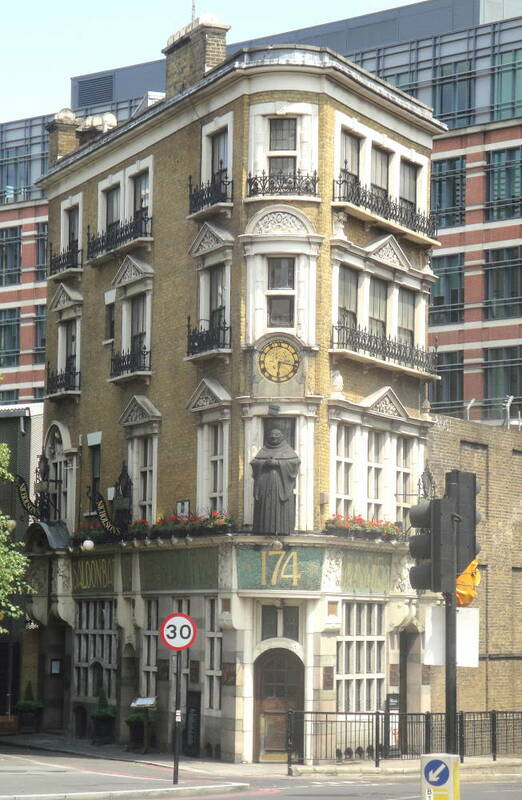 London: Macmillan, rev. ed. 1992. White, Gavin. Nathaniel Hitch — Sculptor. All Saints' Church, St Andrews. Web. 25 July 2011.